Yes, the painting job has finished. David is a thorough professional. He has strong work ethics and is very mindful and respectful of his clients. In the weeks he had been painting, he had become one of us. Tomorrow morning we will miss him! His painting job has been perfect. We are hundred percent satisfied with the painting. He has done a thorough, perfect and exceptional job. Please do convey our thanks to him. We are also thankful to you for organising David. 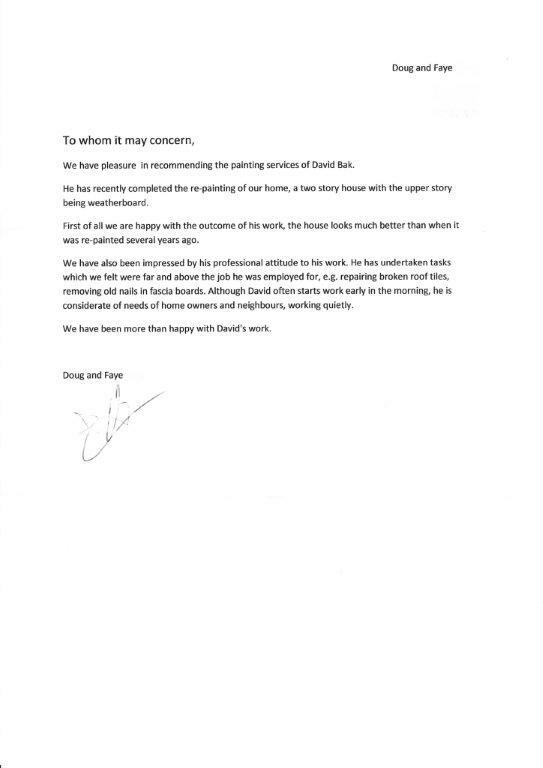 I am writing to let you know how pleased we are with the great job David Bak did in painting the interior of our home. David's first initial visit was very professional, knowledgeable and courteous. He was able to answer all of our questions and provide us with enough information for us to make a decision. The preparation and the actual painting were all done professionally and the finished product was well done and at a reasonable price. David was always on time and extremely hard working. He cleaned after himself every time and always kept us informed as to his progress. We really appreciate that David pointed out some issues with our front window that saved us money. He personally sanded and repainted our front and back doors and windows, to assure his and our satisfaction. Thank you David for making our home look so fresh and vibrant again. We have had many compliments from friends and relatives who visited after the job had been completed. We could't be more pleased with his work and recommend David to any home owner that is in need of a face lift for their home. I am very happy to recommend David Bak from K & D Bak Painting & Decorating. I have referred a number of trades to my clients, but David is the first I've had with such positive and glowing feedback. One of our favourite clients, Heather C from Berwick, just purchased a new home a couple of months ago. The previous owner was a heavy smoker with a firm grip on the 1970's. Heather got David to paint the entire house and was blown away with the quality of his work and the professionalism he showed throughout the long job. She's already referred David to a few of her friends and she's had numerous compliments on his work. So if your house is still sporting a style from yesteryear, then give David a call. He's not only good with a paintbrush, but he does wallpaper too.